I’ve had Nick St. James in my head since I first read a comic called “Hellblazer” by DC comics. His stories and his voice stayed there for many, many years, until I moved to Seattle. It was there that I found the Fremont Troll, and was inspired to finally put Nick to paper. Characters introduce themselves to me but are inspired by me reading stories from different cultures and mythologies. A few of my favorite characters are Norse and Celtic. Nick’s character gave me a chance to read more about the Lakota tribe. Jake’s character gave me the opportunity to learn more about Voodoo practices and beliefs. It was fun giving my own twist to characters and archetypes that have been around for centuries. Brian Freyermuth has had a lot of fun over the last 20 years writing video games and novels. His first game, the original Fallout, won countless awards and was featured at the Smithsonian, while his next title had him working with William Shatner, George Takei and Walter Koenig on Star Trek: Starfleet Academy. In 2012, he created a little bit of Disney history with Marv Wolfman by giving Oswald the Lucky Rabbit a voice for the first time in the game Epic Mickey 2: the Power of Two. Now, he is honored to once again be part of video game history, with Lichdom: Battlemage, where the player can become an unfettered, badass Mage. Creating the Sundancer series, which Brian co-authors with his wife, Juliet, has been an exhilarating process. 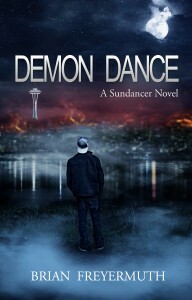 In Demon Dance, private investigator turned novelist Nick St. James seeks help from a cranky voodoo houngan, a role-playing vampire, and Norse goddess to find out what killed his sister-in-law before it kills an innocent mother and daughter. In the sequel, Mind of the Beast, available now on Amazon, Nick races against time to find out why the Green Man keeps infecting people, animals and deities.